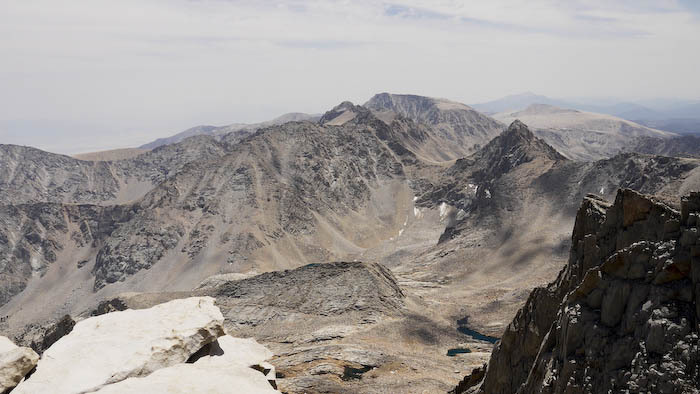 Special Conditions – Special permit required for backpacking and day hiking to Whitney summit. 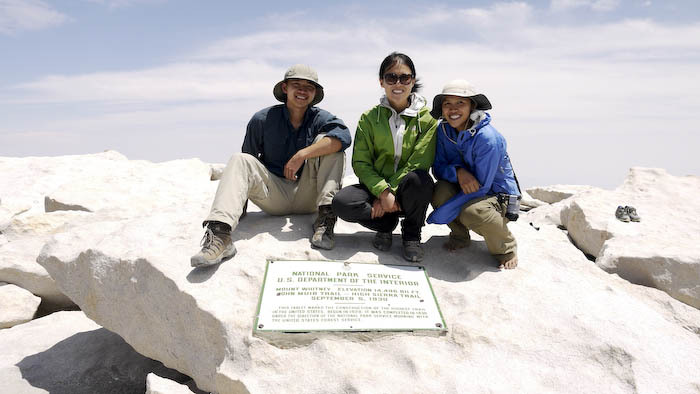 Standing at 14,497 feet, Mount Whitney summit is the tallest peak in the lower U.S. 48 states. 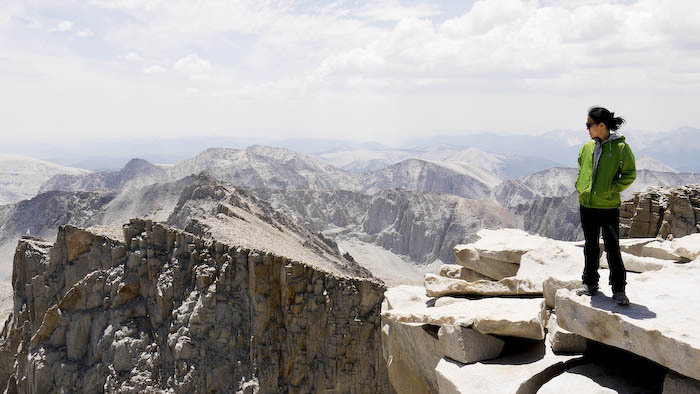 Located in the Eastern Sierra Nevada in Inyo National Forest, the trail head to Mount Whitney summit is about a five hour drive from Los Angeles. Whitney is a popular hike and during the summer months, there is a daily quota. 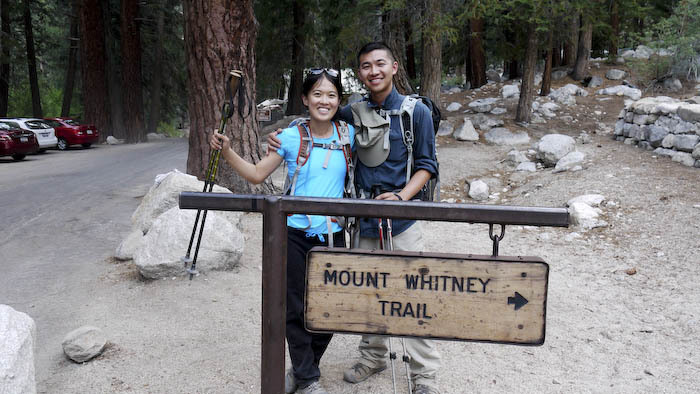 Each day, 100 hikers, 20 backpackers and 20 through hikers are allowed on the Whitney summit trail . Because of the high altitude, there is only a few month out of the year where the trail is free of snow, making the hike possible without special gear. We applied for the Whitney day hike lottery earlier this year. 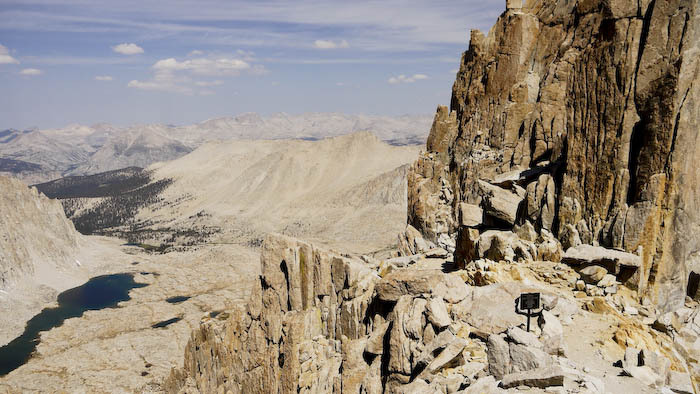 During the busy season (July and August), chances of getting a day hike permit for Whitney is about fifty percent. Once a permit is obtained, a fee of $17 per person is required to complete the permit process. Our permit date was Saturday, July 20, 2013. We took Friday off to drive up to Whitney Portal and stayed at the backpackers overnight campground for an early start on Saturday. The Whitney Portal trail head’s elevation is at 8,360 feet, this is a good point for day hikers and backpackers to acclimate. Make sure you stop off at the Ranger station (13 miles before the portal on I-395) before heading up towards the portal to pick up your permit and map. The permit station is very easy to miss. If you are heading up on Whitney Portal Road, you already passed the permit station. Due to the difficultly of the hike, we were advised by many others to start early Saturday morning. We woke up at 3:30AM, packed up our camping gear and headed out on the trail at 4:15 AM. Still pitch dark, we hiked with our headlamps on for two hours before the sun rise. 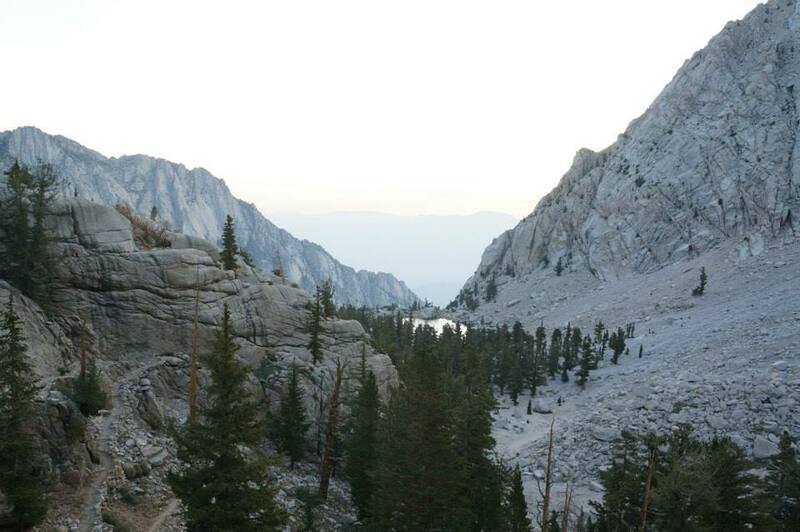 Our first rest break was at Lone Pine Lake, 2.5 miles away from the trail head and 9,850 feet in elevation. The switch backs already started to take a toll. As the hike went on, the switchbacks never ceased to stop. Photo below is six miles into the hike just outside of Trail Camp where most of the backpackers were staying before climbing the peak. This is the start of the famous 99 switchbacks to the summit. It’s hard to believe by looking at the photo below, but the switchbacks actually lead to the very top of the mountain ridge! One look at the ascent, we collectively decided backpacking in overnight would be way more enjoyable than day hiking in. After completing the 99 switch backs and reaching Trail Ridge, we entered Sequoia National Park, approximately 0.25 miles before the start of the John Muir Trail (JMT). We noticed many of the JMT through hikers dropped their packs off around the bend to climb the Whitney summit before proceeding towards Yosemite. The last 1.9 miles to the summit was brutal as the trail become less maintained and weathered. Finally, after nine hours of hiking, we reached the top at 1:00 PM and the view was breathtaking. Even though this is not the highest we’ve been to, this is by far the hardest hike we have done. It pushed us to our limits and taught us a few things. Don’t wear trail runners for this hike. Hard sole shoes (i.e. hiking boots) are recommended because of the large amounts of gravel and rocks on the trail. 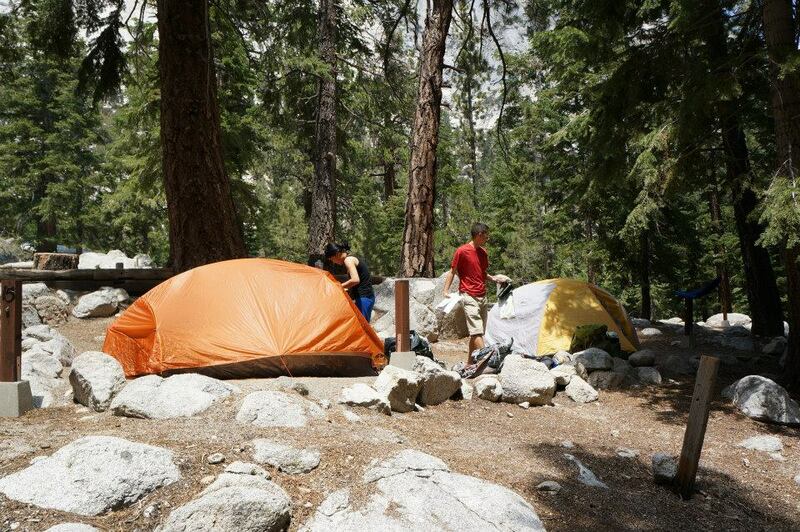 Be sure to bring a water filter on the hike. We met a man on the trail who hiked all the way up to the peak with only one bottle of water. We gave him half a liter of our water to help him make it up to the top. Bring hiking poles, it will really ease the amount of weight on your knees and ankles have to take. Even with the hiking poles, I felt like my lower extremities were ready to detach from my body on the last set of switchbacks. Bring mole skins for your blisters! It doesn’t matter how comfortable your hiking boots are, this is a long and arduous hike, your feet will be sore. It’s better to be prepared than limp back to the parking lot in pain. Have a positive spirit. The switchbacks can seem never ending, be supportive of your group and push each other to finish. Finished with Mt Whitney after a long 15 hour day! 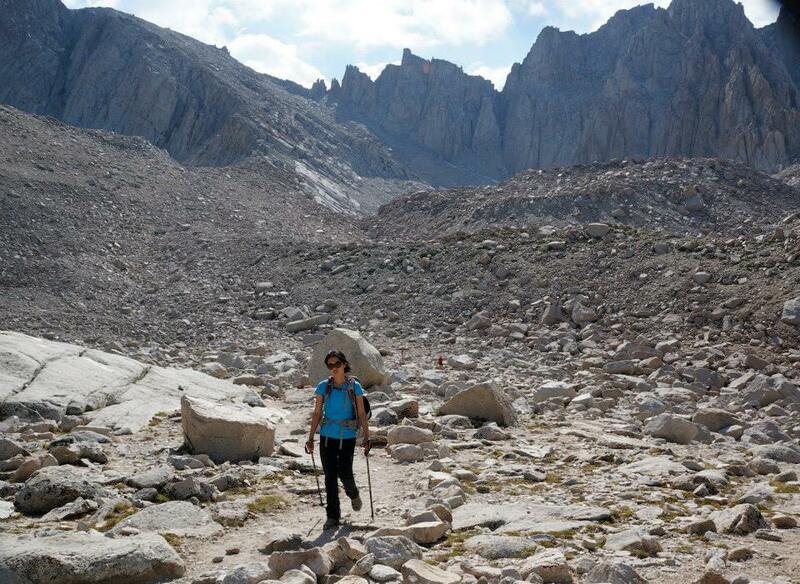 This entry was posted in Trail Reports and tagged backpacking, bucket list, camping, Hiking, Lone Pine, Mt. Whitney, outdoors, summit, Travel, Whitney by hikenoworklater. Bookmark the permalink. Wow!!! Congratulations, it must have felt amazing when you reached the top. This sounds like a killer one day hike! Thanks! We felt very accomplished at the top, it was a super LONG day. Definitely recommend backpacking in next time instead of a day hike. That is a killer long day but a huge indication on how well prepared you were and what a great job you did!!! Well done!